John Barrowman says he can’t wait to jet out to the USA in the New Year to begin work on The New World. Speaking to inexplicably popular Radio 1 DJ Chris Moyles earlier this week, Barrowman certainly does seem to be gearing up to throwing himself into returning as (Group) Captain Jack Harkness as the much-missed Torchwood plans to return with a new 10-part series. 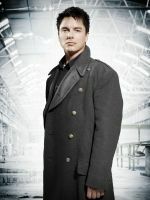 Russell T Davis and Julie Gardner spoke with IGN about the up coming Torchwood The New World. IGN: With Jack, I would guess it’s one of those delicate balancing acts, because as you’re well aware, there is a portion of the fandom still mourning Inato, some of whom will want Jack to still be mourning him. But of course, you want to move forward and not have the character be stuck in sadness. Davies: Of course, we’re aware of that. It’s a love of a great actor and a great performance. It’s not just the love of Ianto, I think it’s probably the love of Gareth David-Lloyd, which is a wonderful thing to see. Even Gareth now has done interviews now, saying, “It’s time to move on.” He’s very kind and respectful. Of course, it’s not a blank slate for Jack. Of course that past haunts him. Not just Ianto, but the terrible events that he took after Ianto’s death with his own grandson will haunt him. Nonetheless the story is at least two years later. And with any fictional character, if they walked into scene one dragging their baggage behind him… If you sit down and someone starts telling you their whole family history, you don’t want to spend any time with them. So that’s true of Jack and everyone in life. So you’ve got to be aware of that. We’ll handle it delicately and suitably and with a great deal of respect, but nonetheless, the imperative is to move on. IGN: Is there room going forward for Jack to have a new love interest? Or will that wait awhile? Davies: He’s not one to wait, is he? And again, that’s touching on an area where you don’t want to cheapen it and you want to respect it, but at the same time, no one wants to deny Jack his life. As with your friends in real life; If you are unlucky enough or sad enough to know people in these circumstances, you do not want the remaining partner’s life to end. So no matter how much he loved Ianto, that love has to become a really positive and enabling thing that will allow Jack to move forward.